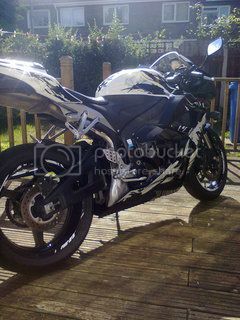 600RR.net > Meeting Point > United Kingdom > Theory test. Just booked my theory test for next month. Was ment to do it a while ago but I lost my paper licence and I have finally got my new one! Anyone know of any good apps or sites to use for revision? theory test? wtf is that? I practiced using this app. Has the mock test etc so I just kept taking them until I was passing well every time. Lol I was like wtf is theory test ? best of luck mate.the theory bits easy,it was the hazard perception bit that screwed me. so glad I got my licence back in the middle ages! didnt have to do hazard perception for car licence,but missed out on bike licence by 2 weeks and had to do it, brother in law managed to get his the day before it came in. Passed theory yesterday :) 48 out of 50 and 56 out of 75 on hazard perception. Happy days. Mod 1 is provisionally booked for 26th march. good luck mate. hope it all goes well for you. well done, looking good to be riding once the weather picks up..might even stop raining by then .... maybe.. Wed be lucky. Im probably going to jinx riding season and its gunna be shot weather. Taken me 6 years just to do this so i wouldnt be suprised! Thats a long waiting list for Mod 1! Is that through work commitment or because they're booked up? You still have to do Mod 2 after that don't you? Wed be lucky. Im probably going to jinx riding season and its gunna be shot weather. congrats on the theory test.